Easy installation without drilling,requires no tools,no damage to the wall. Rubber ring ensure the google wifi sturdy on outlet. Cables Management and adapter behind the mount. Same color with google wifi makes all look beatiful. PERFECT FIT:The outlet wall mount holder specially designed for Google meshy Wifi system, Unique anti-slip dark blue rubber gasket design makes the hook portion fit more snug to the wall plug. 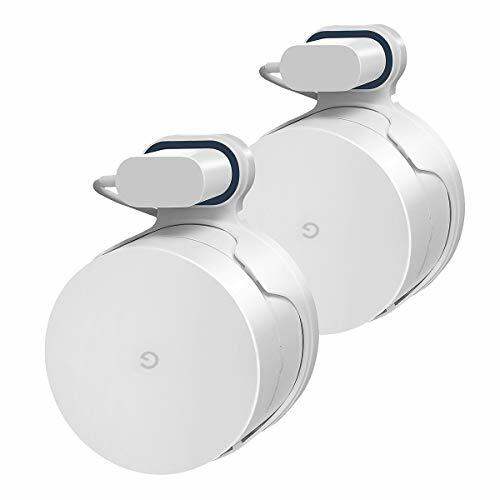 USEFUL AND CLEAR: Ports are open on the side and rear for installing data cables if desired; or simply use as a stand-alone beacon,Looks clean and classic with your Google Wifi. EASY TO MOVE:Can easily be moved from room to room, unlike all the other mounts on the market which require permanent placement. BETTER WIFI SIGNAL AND MOBILITY - Keeps your Google wifi on wall vertically, easy to move from room to room and provides better Wi-Fi Connectivity. If you have any questions about this product by LUOGAO, contact us by completing and submitting the form below. If you are looking for a specif part number, please include it with your message.